The Mid-Atlantic Road Racing Series (MARRS) held its seventh regional SCCA Club Racing event of the 2012 season on Saturday June 30th and Sunday July 1st on the Lightning track at New Jersey Motorsports Park (NJMP) in Millville, NJ. 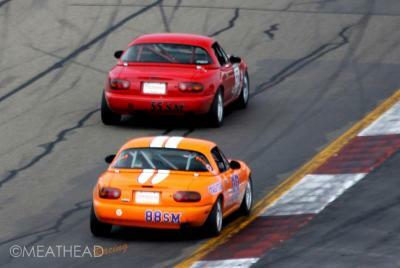 For the first time in the 2012 season, Ted was unable to make it back east to race in the MARRS series. However, Bob and Larry both made the trip to NJ and each "planned" to run in the SM and STL classes. Saturday proved to be a difficult day for Bob. After practicing on Friday and some decent qualifying times for SM and STL, he blew his motor in the SM qualifying race on Saturday and finished 18th in a 19 car field. This effectively knocked him out of all racing for the entire weekend. Larry fared better on Saturday finishing 17th in SM and 1st in STL. On Sunday, in SM, Larry finished 14th out of 16 cars that started. Similar to Bob on Saturday, Larry encountered trouble on Sunday in the STL race when he totaled his car in an off road adventure while earning 2nd place. The fun was not over for Cahall Racing however. On the way home in the Semi, the clutch went out and Larry had to be towed to a Volvo dealer and have the trailer taken to storage. It was a long trip, with pretty exasperating results.